During the 18th and 19th centuries, landscaped parks were the private theme parks of the land-owning classes. They were laid out, at great expense, to conform to a particular landscape ideal: Classical, Picturesque, Romantic. Buildings would be placed to add to the effect. 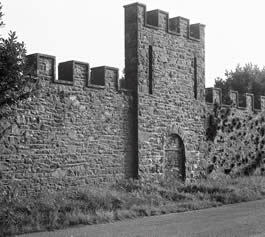 This folly, in the form of stylised castle, served no purpose other than to enhance the view from nearby Terregles House, built in 1788-9. In 1830, a real tower house nearby was demolished. Terregles House was blown up in 1964.